The New Craftsmen have curated a selection of products highlighting the makers, materials and skills of the British Isles. The collection seeks to champion traditional skills being used in contemporary ways, like this Brodgar straw back chair by Gareth Neal and Kevin Gauld (above), which draws inspiration from the traditional Orkney Chair. The straw back is woven from Orkney-grown oats and a pull-out draw sits below the Windsor vernacular base. These exquisite hand patterned silver wine goblets are by Ndidi Ekubia. I've admired the work of award winning potter Billy Lloyd for some time. His thrown porcelain pitcher and bowl is a contemporary take on the Victorian pitcher and bowl set. 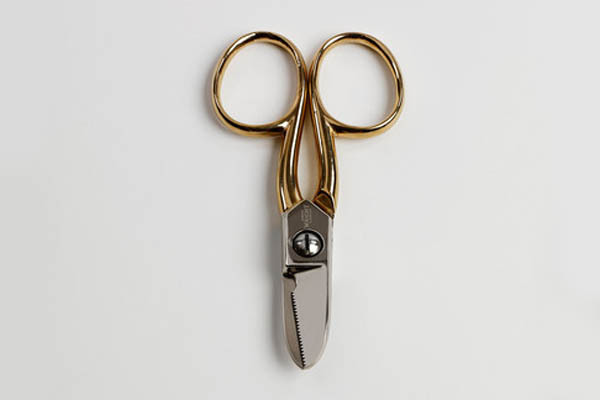 Flower lovers who appreciate the joys of a good pair of scissors will love these gold plated floral art scissors by Sheffield based traditional family company Ernest Wright & Co. As well as being designed to crush stems they also come complete with a notch for removing rose thorns. The family's association with the scissors industry dates back more than 150 years. The Pippy Oak Reader Side Bench by Galvin Brothers celebrates the qualities of British oak - with bark and waney edge intact. Gold plated steel legs add a touch of decadence.